If you’re a fan of classic watchmaking skills and you like mechanical complications, you might want to take a look at Vulcain watches. 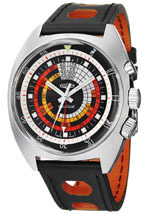 Founded in Switzerland in 1858, Vulcain watches are still built today using old-school manufacturing techniques, with mechanical movements and elaborate complications. The brand featured the first watch with a reliable and audible alarm, and U.S presidents Johnson, Eisenhower, and Truman all wore the brand. Their build quality is great, their production is small and their reputation is solid. If you’re looking for something that’s going to last for decades while looking great and offering terrific performance, you should definitely consider them. 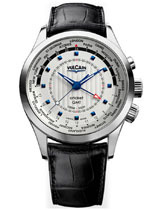 Read on for the full Vulcain watches review. The build quality is exceptional; they use stainless steel, gold and titanium in their cases. Bracelets and straps are gold, stainless steel, leather and rubber, depending on the model. They use scratch-resistant UV-protected sapphire crystal to protect the watch face and their watches feature screw-down crowns. Water resistance will vary by model, but some models offer up to 1000 meters of resistance, making these rock-solid timepieces. The movements are Swiss-made, of course, and are either automatic or mechanical. These movements are made in-house and aren’t brought in from third parties. 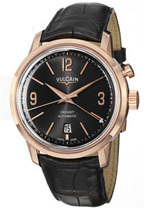 Vulcain watches have a long history of innovation, starting with their Cricket and President’s models, which were among the world’s first to feature an audible alarm. It’s one thing to put an alarm in a watch; it’s another thing to make them loud enough to be functional. The company managed to do that, but they also offer other complications, including the date, phases of the moon and the increasingly popular tourbillon. If you like complications and skeleton models so you can see them, then these watches are worth your consideration. The stylingtends towards the traditional, though there are a few sports-styled watches and a few that are a bit more interesting, such as the colorful Cloisonne series, which feature elaborate artwork on the face, while offering world times around the bezel. Models are available with steel, gold or titanium cases. Displays are all analog. A few skeleton models are available if you want to see the works inside your timepiece. Many models are limited in production, so if you like the exclusive, this brand might be a good choice for you. As all of their watches include mechanical movements, care and maintenance are a bit more involved than they would be for quartz-powered watches. You should store your watches in a cool, dry place and keep them away from extremes of temperature or strong magnetic fields. Automatic models should be stored in a watch winder if you’re not wearing it regularly; this will keep the movement working correctly and keeping proper time. You should have your watch inspected by a qualified technician every three to five years to see if the watch needs servicing; if so, it may need to be returned to the factory for servicing, which will involve disassembly, cleaning and replacement of worn parts. With proper care, these timepieces should run well for many years, if not decades. While their products are exceptionally well made, the warranty offered with the purchase is merely average. Your purchase is warranted for two years from the date of purchase against defects in materials and craftsmanship. This is the industry average and most companies offer a similar warranty. The watches are thoroughly tested at the factory prior to shipping, so defects are likely quite rare. As luxury watches go, you’ll find that this brand is moderately to very expensive. Models start at just under $4000 and are priced up to about $50,000 or so. The more expensive models either feature elaborate complications or are limited editions. Still, even the lower-end models are attractive and quite well made. As this is an older brand with a history of innovation and complications, there is collector interest in the brand, and older, and out-of-production models do sell for premium prices on the collector’s market. We’re not suggesting that you buy as an investment, but it’s possible that the watch you buy today may increase in value over time. As with many luxury items, distribution and pricing is strictly controlled by the manufacturer. When you make limited edition luxury items, you want the public to perceive them as special and unusual and not common or ordinary. In order to do this, the company sells their product only through a small and select group of retailers, which are generally high-end jewelry stores in major cities. By making the product hard to get and by strictly controlling the price, the manufacturer can keep demand ahead of supply, which help keeps the prices strong. Officially, you can buy only through authorized dealers, but unofficially, there are some other retailers who carry the brand. You can find these retailers on the Internet and they will provide your best opportunity to buy at a discount. As many Vulcain watches are limited in production, don’t be surprised if you can’t find all models for sale at any single retailer. Among watch collectors and aficionados, older manufacturers and those that make mechanical models and watches with complications have long been popular. Sure, it’s easy to make an inexpensive, highly accurate quartz watch, but there’s a lot to be said for the technical skill and innovation that come with building a reliable and attractive mechanical watch and in that arena, these watches are exceptional. They’re making classic models that continue to work well even after a half a century or more of production and their models are sturdy, attractive and likely to look good and work well for a long time. If you like the rare, the unusual and the classic, all in one, then Vulcain watches are likely to be a good choice for you.